Those looking for something new in the governor’s second inaugural speech found it, right after he talked about reining in property taxes. That’s either a concession or a counterattack, but it addresses a fundamental complaint of local government officials who have said it’s unfair for the state to limit local sources of revenue at the same time it is requiring them to take on new and expensive duties. If those new chores came with money, they contend, there would be less justification for raising local taxes — at least on that score. Set aside, for now, the many spots in Texas where population growth is outstripping cities’ and counties’ ability to build infrastructure and bolster services like police and fire. Abbott sounds like a guy with a new idea for Texas: making the state step up to pay for the programs it creates. The Texas share of the cost of public education has slipped below one-third of the total cost, according to the latest numbers from the Legislature, while local taxpayers’ burden has topped 55 percent of the tab. Abbott and his partners in all this — Lt. Gov. Dan Patrick and House Speaker Dennis Bonnen — have made school finance (including teacher pay raises) and property taxes their priorities this session. They’re proposing to put more state money into schools. If they’re serious about unfunded mandates, they’re either talking about putting state money into mandated local programs, or they’re talking about killing those local programs. They’ll have to choose between the financial burden and the social one; either way would be acknowledgment that the burden belongs to the state. That’s new. It’s just rhetorical so far — not included in either of the proposed budgets from the House or Senate — but it’s a start. This session doesn’t mark the state’s first run at limits on increases in local property taxes. The three top officials are talking about it, though, and the local officials who’ve been resisting limits are preparing their defenses. The Texas Conference of Urban Counties, for instance, pulled the fiscal year 2017 numbers for indigent defense spending by the state’s 254 counties. According to numbers compiled by the Texas Indigent Defense Commission, the full bill for defending accused criminals who couldn’t afford their own lawyers was $260.5 million. Defendants reimbursed the counties for $10.3 million of those expenses, and the state reimbursed $37.2 million. Providing indigent defendants with lawyers is required by the state, a mandate. And the cost to the counties over and above what the state and the defendants paid was $213.2 million. It’s not big money, as these things go, but indigent defense isn’t the biggest item on the list of unfunded mandates to counties. It’s just an example. And you won’t hear counties complaining about some things that could technically be considered unfunded mandates. Your local district attorney is paid with local tax dollars, but that office is required by the state. The counties aren’t squawking about indigent defense costs, but they stand ready and willing to complain about the jail spending that stacks up without state reimbursement. Just ask one of them. It has provided their best — and to date, successful — argument against the state-imposed restrictions on rising property taxes. But state officials are elected, and their voters have been noisy about property taxes for a long time. 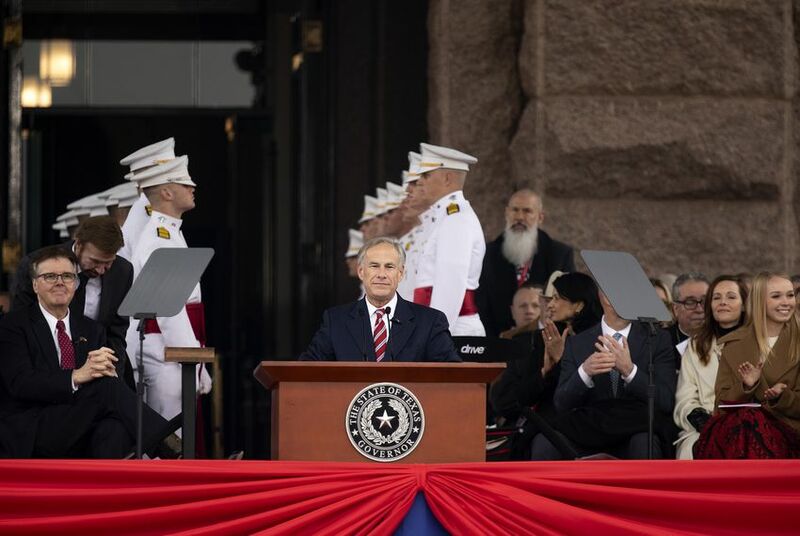 The new speech line from the governor could indicate some willingness to help the counties with those mandates, but it didn’t remove the more familiar call for restraint from Abbott’s inaugural address. He and the state’s other top officials might be sympathetic, but they still want to put a leash on local taxing entities. Disclosure: The Texas Conference of Urban Counties has been a financial supporter of The Texas Tribune, a nonprofit, nonpartisan news organization that is funded in part by donations from members, foundations and corporate sponsors. Financial supporters play no role in the Tribune's journalism. Find a complete list of them here.